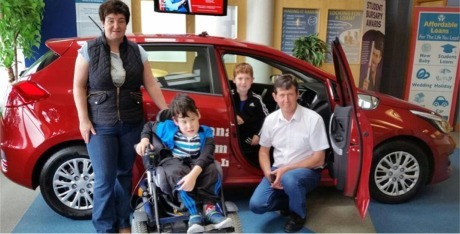 A MALIN Head family are celebrating this week after winning a brand new car in a local draw. Kathleen and John McGilloway won the stylish new Kia Cee'd in the Buncrana Credit Union Members' Draw which took place on Saturday. There were 12 cash prize winners who scooped €100 in the big giveaway. Another draw will take place in January 2017. Buncrana Credit Union, which merged with Inishowen Credit Union Limited in September 2015, now have almost 18,000 members throughout the peninsula. It loaned almost €8 million euro to its members last year. The credit union, at Cockhill Road, shared a photo of the McGilloway family including sons Sean and Joseph, with Facebook followers. The post has attracted many warm wishes for the Malin Head family on their lucky win. The Kia Cee'd was supplied by long-running local business Inishowen Motors who have showrooms in Malin village and Letterkenny.